A Cup of Jo: My juicing days are almost over!! Hello everyone!! Thanks for all of your support with my juicing fast!! It’s one of the hardest journeys I’ve ever embarked on. I sound like Christopher Columbus, but I just can’t help myself. I didn’t think it would be so difficult on me mentally, and it definitely is proving to be quite a challenge. This cleanse has been really eye-opening for me. It has allowed me to get in touch with my body’s needs and really listen to what it’s telling me. I didn’t realize exactly how much waste was in my body, but I soon discovered it in the toilet haha I was really shocked, but relieved at the same time. I don’t weigh myself, but I honestly feel 10 pounds lighter and my belly doesn’t have a huge bloat in it anymore. Wednesday is my last day of the fast, and it’s the 6th day. I wanted to do it until Friday but my body is done. I need food!!! My first meal on Thursday is going to be soaked prunes because I want to eat something that is a natural laxative. I’m just going to eat small meals for the next few days in order to see how my digestive system reacts. If any of you are interested in doing a juice fast and haven’t done one before, I made some amazing juices that you would just love. My favorite juice of all time is apple juice so I knew that I had to make my own. There’s NOTHING like homemade apple juice. The juice makes foam on the top and it’s just so darn sweet- I LOVE it. It kind of looks like beer (because you all know that my main intention was to clone beer in fruit juice form). I used a 3 pound bag of apples and got about 3 cups of juice. It takes a ton of fruits and veggies to actually make juice- I was shocked. And of course, I had to work at Sears every day during the fast so that was just a dandy time. I warned everyone there that I was fasting and would be frequenting the bathroom. 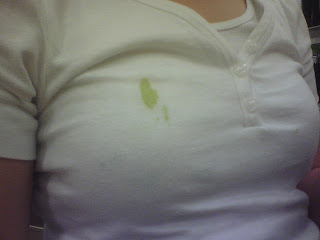 I wasn’t embarrassed because everyone has to poop haha some more than others… Obviously, being the slob that I am, I got some of my celery juice on my shirt which kind of looks like baby throw-up. Surprisingly, my customers didn’t comment on it, but I’m positive they thought I was producing green milk for my alien child. it's true. everyone poops, haha! you go girl, fasting is definitely difficult. my body needs one too. it's been awhile and the stress hives on my arms this week are telling me i need to cleanse. i start on saturday and will go for 10 days, hopefully i'll make it. vegetable soup and apple sauce are always good starters to reintroduce solid food too. both are easy to make as well. by the way, great eyebrows in that photo! girl you are so determined and i so admire that. i dont think i can ever do a juice fast! i bet your skin looks even more luminous now! Wow, good for you for sticking with it and getting in touch with your bodies needs. I'm not sure I could do it - and I'm not that into juice, either! Go easy on the prunes! I'm really glad that you got such positive results from the fast! I can imagine its difficult, I was craving cooked food with just a day of trying to be raw yesterday..way to go! I made fresh orange juice, and was kind of appalled by how many oranges I had to use, its really a lot! good for you jo! you have much more initiative than i do. do you mind me asking how much your food dehydrator set you back? Congrats and good luck with the rest of the fast! It sounds hard and interesting at the same time. I'm glad things went well for your juice fast! I am thinking about doing one for a day, there's no way I can go longer! If that goes well maybe one day a week. You are so amazing! WOah! Good job on the six days, I didn't keep with mine and decided to do it every other day a while, oh well. Wow! Congratulations! So you just juiced everything for 6 days? Only fruits and veggies? Did you just drink three glasses of juice a day plus water or more? rock on with the juice fast! nice job! easing back into food is a good idea, indeed! green alien milk!?! ahahahahahaa! you crack me up, Joanna! i've never had homemade apple juice - it looks delicious! i've gotta try that! Haha you are too cute! Yes, everyone poops, that is for sure! hon was gonna tell you your blog wasn't visible yesterday but now it's back to normal.odd. u are too kind to wanna pay for my travel. you are so generous.i am so in love with you.lol. very cute about the peter frampton story....listen to the song....aren't you glad i came along. yes pic is tres wonderful.josh is amazing.i will be featuring more of his work. congrats on making it that long. it's a lot of work to make those juices and takes a ton of produce!! So, how was the food after the famine? Hey! I stumbled across your blog in my vegan food blog travels, and noticed you are from Bethel Park- I'm from Upper St. Clair! I was psyched to see someone who lived so close, especially in the vegan community, considering the Pittsburgh stereotype is unhealthy and not progressive. Are you in school right now? Have you lived in the burgh your whole life? p.s. Kudos on completing a juice fast, that is no easy task. I did a "fast" once that consisted of this lemon juice stuff but I had to add a cup of rice at each meal cause I couldn't handle the hunger. So congrats! "but I’m positive they thought I was producing green milk for my alien child". LOL! I almost fell off my chair with that one! 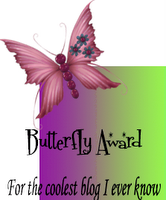 You are the funnest blogger in blogland! A traveling circus.. that would be interesting given that I'm a clumsy mess! Perhaps I could grow a beard and be the bearded lady? that is such a funny pic! you look like you're ready for it to be over. too funny.